Where did your family come from? Most of our families came from somewhere else, and their migration is part of our heritage. 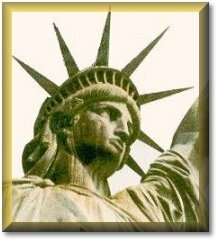 America is a nation of immigrants - people who have moved to the United States from other countries. At the end of the 1800s, Italians, Poles, Armenians, Russians and others from southern and eastern Europe were allowed to enter America on the east coast. On the west coast, Chinese and Japanese immigrants arrived. The ports of Ellis Island, New York and Angel Island, San Francisco served as the official entries for the greatest human migration in history. Ellis Island was called "The Golden Door", but what did it feel like to go through that door? How it would have felt to make the decision to leave your homeland forever? What kind of welcome would you have received upon your arrival in America? What was it like to settle in an unfamiliar country? You and your team will explore the problems of newcomers to our country. One of you will take the part of a immigration official charged with controlling the flow of immigrants. The rest of you will be the members of a family from a foreign country. The immigration official will learn about what regulations there were and how they were enforced. The mother of the family will research why you left your country. The son or daughter will find out what the journey to America was like. The father of the family will learn about what happened when the family arrived in this country. When you are finished. you will show the rest of the class what it was like to immigrate from your country. You can present this information in a slide show, a poster display, an immigration interview, or a play. You will be part of a group of four people. Decide which group member will research each role. Decide which country your family came from. You're ready to begin your journey to the new land. Take a tour of the Ellis Island immigration center by clicking on this site. Pretend it is your first day in this country and this is what you see. Now it is time to research your part of your family's experience. Immigration Official: Use sites that tell what the immigration regulations were and what the officials did to check the newcomers. Mother: Your job is to find out what conditions is the old country were like. Why do you think your family wanted to move? Child: Find out how people got to this country. What was the journey like? How did people occupy their time on the journey? Father: Research the Ellis or Angel Island experience. Investigate where the immigrants might settle. What was your family's experience on the island probably like? What kind of house will your family settle in? These are some other resources that are available, but you may locate others on the internet. You may also find books in the library or interview friends or relatives who are immigrants. http://teacher.scholastic.com/immigrat/ellis/index.htm this site has photographs of Ellis Island, and you can 'walk' your way through the various buildings and museums. Also included are immigrants' stories, and interviews with immigrants from around the world. http://www.thirteen.org/archive/tenement/--visit a New York tenement museum that shows how the immigrants lived. http://www.nde.state.ne.us/SS/irish/unit_5.html--a textbook that tells about conditions before leaving Ireland, on the ship, and in America. Now it's time to decide how you will present what you've learned to the class. A Slide Show: Use Hyperstudio or Kidpix to create slides with text, pictures and/or graphics to show what all four of you have learned. A Poster Presentation: Make a poster with pictures and text that shows what you've learned. Plan how you will orally tell the class about it. An Immigration Interview: Write an interview in which all four of you will have a part. At least part of it will show the kinds of questions the immigration officials probably asked. A Play: Write a play that shows conditions in the old country, what the journey was like, and what happened in the new land. All four of you must have a part. Each of the members of your group will receive the same score based on the quality of your final product as well as how well you worked together. Quality of Research An understanding of only one element of immigration is shown in the project. An understanding of only two elements is shown in the project. An understanding of only three elements is shown in the project. The project shows an understanding of all four elements of immigration. creative, accurate information from all four elements, neatness, and grammatical correctness. The project satisfies three of the following criteria: creative, accurate information from all four elements, neatness, and grammatical correctness. The project is creative, includes accurate information from all four elements of immigration, is neat, and grammatically correct. Presentation satisfies one of these criteria: is organized, interesting, involves all group members, and is delivered competently. Presentation satisfies two of these criteria: is organized, interesting, involves all group members, and is delivered competently. Presentation satisfies three of these criteria: is organized, interesting, involves all group members, and is delivered competently. Presentation is organized, interesting, involves all group members, and is delivered competently. Quality of Collaboration Group members have difficulty with being able to show cooperation in working on tasks, take responsibility for their part of the assignment, and exhibit effective conflict resolution while working. Group members sometimes show cooperation in working on tasks, take responsibility for their part of the assignment, and exhibit effective conflict resolution while working. Group members often show cooperation in working on tasks, take responsibility for their part of the assignment, and exhibit effective conflict resolution while working. Group members usually show cooperation in working on tasks, take responsibility for their part of the assignment, and exhibit effective conflict resolution while working. Now that you have learned about the immigrant experience, what do you think? Was coming to America a golden opportunity? Should the U.S. make restrictions on people who seek asylum or the chance to improve their lives? I would like to thank Derrick Swistak for the use of his WebQuest templates. These can be found at http://swistak.com.